I just picked a raspberry from my babysitter’s bushes. We walked the length of an overstretched dirt road with buckets, the four of us children. We were on a peacock farm with these animals walking liberally around us. I felt a strong oddity to go over and pluck out one of the feathers. The emerald green and turquoise were candy to my adolescent eyes. As we crammed our buckets with berries our fingers stained with cavernous scarlet juices. I just couldn’t ignore the peacocks. I was forever told if I let the feather descend out on its own, I could keep it. I trudged my feet over to the peacock and stared at him. Posted on June 16, 2010 July 7, 2010 by Nelly	This entry was posted in Shorty Stories and tagged Fiction, Peacock, Short Stories. Bookmark the permalink. 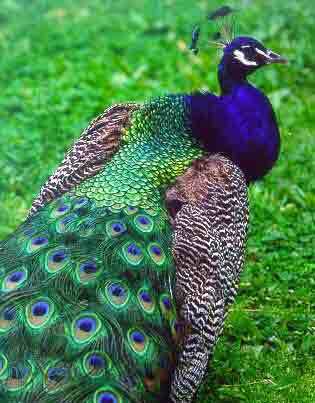 they are so gorgeous, as a child i too longed to have one of their gorgeous feathers.